AuthorMitaliPerkins: Happy Paperback Launch, TIGER BOY! Happy Paperback Launch, TIGER BOY! To celebrate the paperback release of TIGER BOY (Charlesbridge | 6/6), the Avid Reader (apt name for an indie, right?) in Davis, California is hosting an event. You're invited to join us if you're in the Sacramento Valley area. 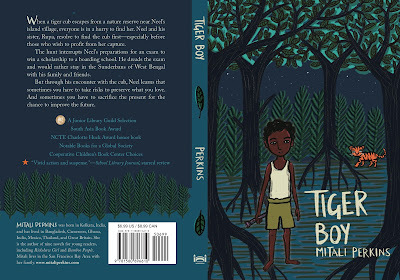 The Avid Reader is excited to welcome Mitali Perkins for a reading, discussion, and signing of her fast-paced and well researched chapter book, “Tiger Boy” on Saturday, June 17th at 1:00 p.m. When a tiger cub escapes from a nature reserve near Neel’s island village, the rangers and villagers hurry to find her before the cub’s anxious mother follows suit and endangers them all. Mr. Gupta, a rich newcomer to the island, is also searching—he wants to sell the cub’s body parts on the black market. Neel and his sister, Rupa, resolve to find the cub first and bring her back to the reserve where she belongs. The hunt for the cub interrupts Neel’s preparations for an exam to win a prestigious scholarship at a boarding school far from home. Neel doesn’t mind—he dreads the exam and would rather stay on his beloved island in the Sunderbans of West Bengal with his family and friends. But through his encounter with the cub, Neil learns that sometimes you have to take risks to preserve what you love. And sometimes you have to sacrifice the present for the chance to improve the future. Event date: Saturday, June 17, 2017, 1-2 p.m.